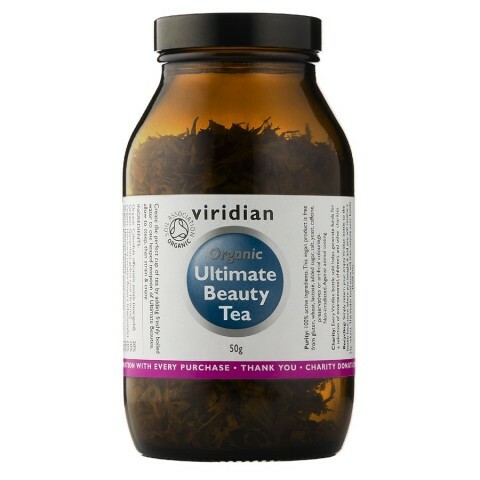 Drink deliciously sweet and aromatic Ultimate Beauty Tea as part of your beauty regimen alongside a fresh organic varied diet, plenty of water and supplements including Ultimate Beauty Complex capsules or Ultimate Beauty Skin Hydration capsules and Ultimate Beauty Oil. Ultimate Beauty Tea is certified organic by the Soil Association. Organic Calendula officinalis petals (marigold) 20%,_Organic Glycyrrhiza glabra root (licorice) 20%,_Organic Matricaria recutita flowers (chamomile) 20%,_Organic Hibiscus flowers 20%,_Organic Rosa damascena petals (rose) 10%,_Organic Galium aperine leaves (cleavers) 10%.